Kudos to Elon Musk, his peers like Jeff Bezos, and many more not-so-public figures striving to move our species forward to better times. US goverments lost any sense of science leadership decades ago. Not as good a vote-getter as 19th Century bible-thumping and bigotry. Congress remains more concerned with job security than justice, myths of pearly gates instead of education and health. The hopes and praise fall to Elon Musk. An immigrant who got round to becoming a citizen in this millennium. Elon Musk Explains Why SpaceX’s Falcon Heavy Core Booster Crashed https://www.space.com/39690-elon-musk-explains-falcon-heavy-core-booster-crash.html “… That core booster, which was expected to land offshore on SpaceX’s drone ship “Of Course I Still Love You,” crashed when two of three engines did not fire during a final landing burn, Musk told reporters after the launch. The booster missed the landing ship by about 328 feet (100 meters) and hit the water at 300 mph (484 km/h), damaging thrusters on the nearby droneship, Musk has said. 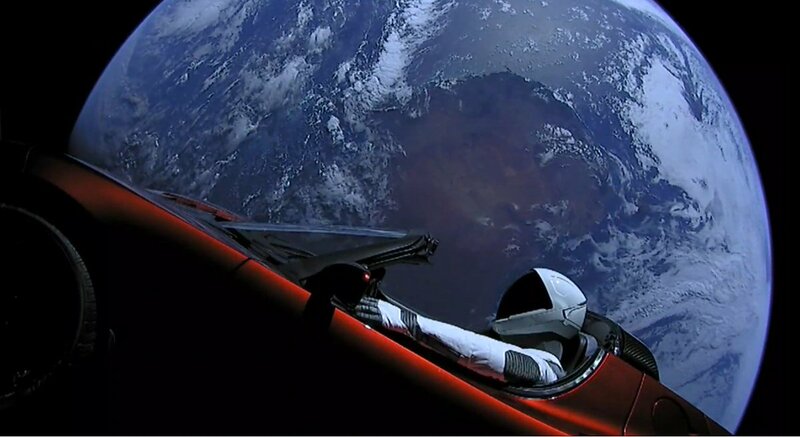 Track Elon Musk’s Tesla Roadster in space with this aptly named website https://www.theverge.com/2018/2/17/17019796/where-is-roadster-website-tesla-spacex-elon-musk-falcon-heavy Based on data from Nasa’s Jet Propulsion Laboratory, the Roadster is now over 1.8 million miles (over 3 million kilometers) from Earth, slightly beyond the orbit of Mars.